" As a different consciousness dawns at the beginning of a new millennium we are at last shaking off the confines of a purely scientific approach to life and embracing concepts that were accepted by our ancestors many thousands of years ago." Over the past few decades the explosion of interest in complementary medicine has led to a deeper understanding of how the body functions and how energy flows through it. The subtle energy anatomy of the aura charkas and meridians is becoming increasingly understood and accepted throughout the medical and health care community as well as millions of people world wide. While orthodox medicine uses chemistry to describe our physical system, what is now understood is that for any chemical action to take place a change in the electromagnetic energy of the body must occur. This change must emanate from the mind through the energy of our thought patterns and explains the importance of the mind-body links to our physical, emotional and mental health. The fact that we cannot physically detect our charkas or aura can be explained thus: They operate as energy fields vibrating at a rate normally undetectable by the human eye. These ever changing energy flows have been documented by using Kirlian photography. 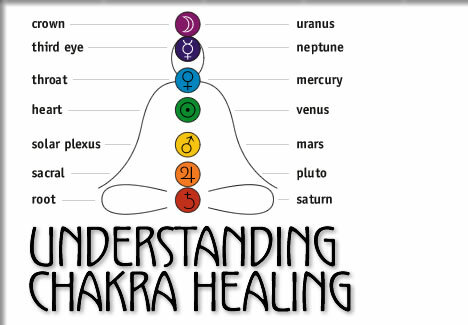 Chakra healing is based on the belief that in order for totally balanced well being we must act as an integrated whole. The holistic nature of the chakra system outlines how in order to maintain a healthy, balanced life we must attend not just to certain physical dysfunctions that may occur but to our emotional, intellectual and spiritual needs as well. Each of the main seven charkas deals with different parts of this bigger picture and directs us to those areas where we might be functioning out of balance. Chakras operate like interconnected, self—opening valves that channel the "electrical current" of universal life force into the body. When there is a dysfunction or blockage in one part of the system it has an impact on all the other parts. Such malfunction can occur when the energy flowing through one or more of the charkas is either excessive or deficient. Opening the mind and appreciating the very real benefits that come from balancing our human energy system we will learn to discard the need for material evidence of their existence and let personal experience and enhanced well being provide this for us. Chakra healing is explained by Tofino massage therapist Christy Lindell of Reflections Holistic Retreat in Tofino.